Today we’re releasing new data for the Transparency Report, showing that the steady increase in government requests for our users’ data continued in the second half of 2012, as usage of our services continued to grow. We’ve shared figures like this since 2010 because it’s important for people to understand how government actions affect them. 68 percent of the requests Google received from government entities in the U.S. were through subpoenas. These are requests for user-identifying information, issued under the Electronic Communications Privacy Act (“ECPA”), and are the easiest to get because they typically don’t involve judges. 22 percent were through ECPA search warrants. These are, generally speaking, orders issued by judges under ECPA, based on a demonstration of “probable cause” to believe that certain information related to a crime is presently in the place to be searched. The remaining 10 percent were mostly court orders issued under ECPA by judges or other processes that are difficult to categorize. User data requests of all kinds have increased by more than 70 percent since 2009, as you can see in our new visualizations of overall trends. In total, we received 21,389 requests for information about 33,634 users from July through December 2012. We’ll keep looking for more ways to inform you about government requests and how we handle them. We hope more companies and governments themselves join us in this effort by releasing similar kinds of data. 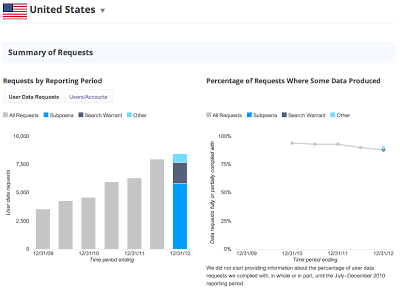 One last thing: You may have noticed that the latest Transparency Report doesn’t include new data on content removals. That’s because we’ve decided to release those numbers separately going forward. Stay tuned for that data.